Based in the Jura mountains, Switzerland, BMC is perfectly situated for developing and testing suspension bikes, so we were keen to find out if there’s more to the Trailfox than initially meets the eye. With triple-butted tubing, a tapered head tube and a massively oversized down tube, the front triangle of the Trailfox ticks all the correct boxes. But BMC isn’t simply following fashion, as the Integrated Skeleton Concept — which sees the seat tube braced to the underside of the top tube — flips conventional styling on its head in favour of improved strength. Moving rearward, the Trailfox sports 142x12mm Maxle dropouts but out on the trail the back end of the BMC doesn’t feel as stiff as the standard quick-release rear ends found on the Mondraker or Giant. Obviously there’s no flex in the welded one-piece rocker link, so it is probably due to the rear triangle only being braced vertically on the non-drive side. Setting up the 150mm-travel Advanced Pivot System (APS) suspension on the Trailfox is a task made easier by the Lapierre-esque sag indicator on the rocker link — which BMC calls the ‘initial load indicator’. All pivots use cartridge bearings and the Trailfox gets a medium compression and rebound-tune RP2 shock. 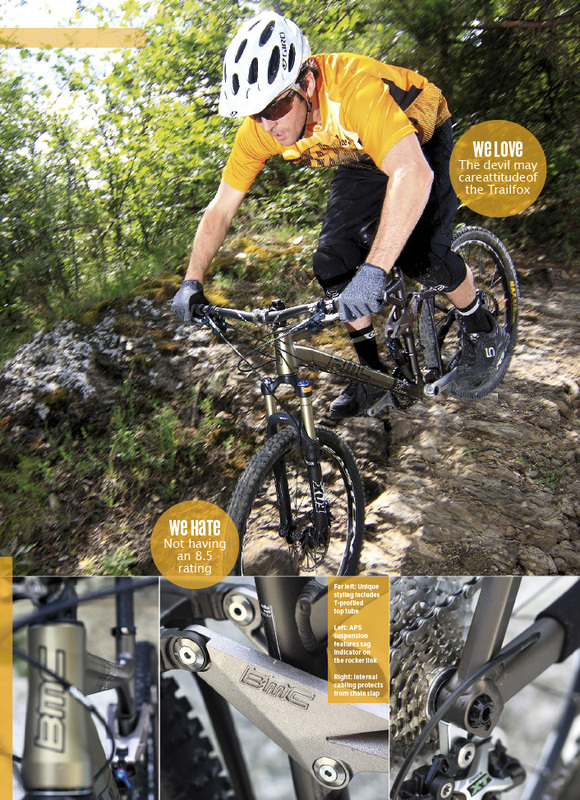 Up front, the Talas II adjuster on the open-bath Fox fork lets you drop the travel from 150mm to 120mm for climbing. And, given the relatively slack 65.9° head angle, it comes in useful for those arduous fire road climbs. There is no denying that Schwalbe’s Nobby Nic tyres are lightweight and fast-rolling, but they puncture easily and stop you getting your knee down in corners. Thankfully the Easton Vice wheels, shod with our Maxxis control tyres, were every bit the match for the BMC’s big-mountain attitude. Fast freehub engagement, good spoke tension and overall stiffness, combined with a sensible rim width, make the Easton Vice a formidable wheelset. They are also the lightest wheels in test. When the rear mech cable outer exploded just above the rear mech and before entering the chainstay, the BMC’s 30-speed Shimano transmission was reduced to three usable gears. Much to our surprise, and relief, the new outer casing threaded easily through the chainstay. But the weakest link in the Trailfox’s transmission is the cheap looking, non-hollow-forged chainset — the crank arms don’t offer anything like the same stiffness-to-weight ratio as the SLX cranks on the Giant. With its 70mm stem, the BMC is halfway home. Add a wider bar with a bit less back-sweep and the cockpit would be dialled. Once we’d swapped the bar, stem, tyres and grips for our chosen control parts, the BMC instantly felt like a good bike. The riding position on the medium size was excellent and the controlled, neutral nature of the APS rear suspension had us instantly up to speed. Grip under braking is truly impressive and if you are coming from a more traditional XC trail bike the quality suspension, balanced riding position and slack head angle will have you brimming with confidence on every descent. Granted, the slacker head angle feels more unruly on the climbs, but it’s a compromise that we’re more than happy with given that the Trailfox has 150mm of very capable travel. Also using the ProPedal and Talas adjusters, in combination or independently, really aids climbing efficiency. 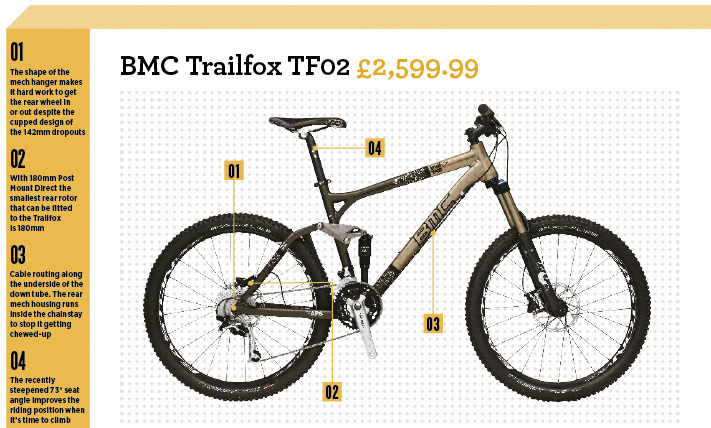 BMC has got the fundamentals covered with the Trailfox TF02: fit, geometry, suspension and braking are all dialled. The bike pedals efficiently in the middle ring and BMC just needs to work on the finishing touches for this bike to be considered a great package. It is the standout bike here but the Trailfox faces stiff competition from the Lapierre Zesty 514, which is £200 more but gets a much higher spec, including a FIT-damped Fox fork. We rated the Zesty 9 out of 10 in our Ultimate Trail Bikes test, leaving us no choice but to give the Trailfox TF02 an 8, even if it deserves a slightly higher score. Thanks to Adrian and Jo from Rivierabike.co.uk for showing us the amazing trails around Molini, near San Remo, Italy, during this test. Check them out, you won’t be disappointed.